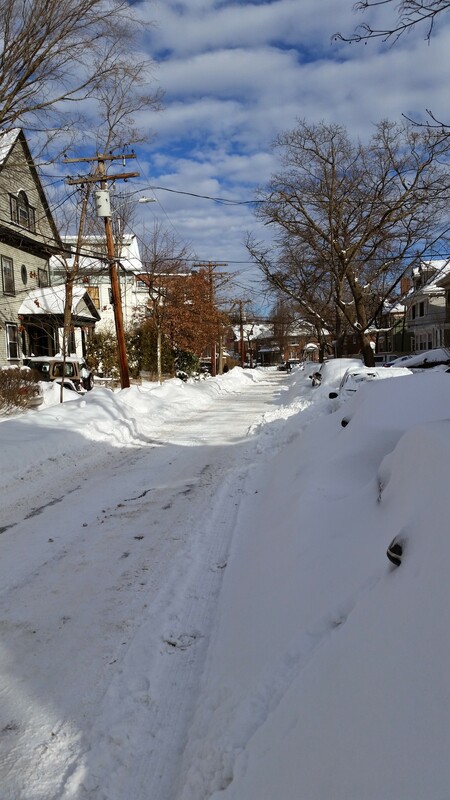 With all the snow that we’ve been getting for our first winter in the Northeast, I wanted to keep a record of it all, and this will keep everyone up to date on snow amounts and our snow days. We’ve been setting tons of records out here, with the Blizzard 2015/Juno and multiple snow showers, and we’re working on the most in a certain time period..we’ve already broke the 20 and 30 count in just 19 days; up next is the 40 day total. So, here’s a breakdown. I’ve forgotten most of the small snow days, but those aren’t as fun. Tuesday, January 27th – One of the largest blizzards in Boston history, we got around 30 inches over about a 36 hour time span. A state of emergency was declared, banning driving and closing everything, including colleges and the MBTA. I got two snow days, while Harvard only gave Cade one, and did I not leave our apartment for about 48 hours. 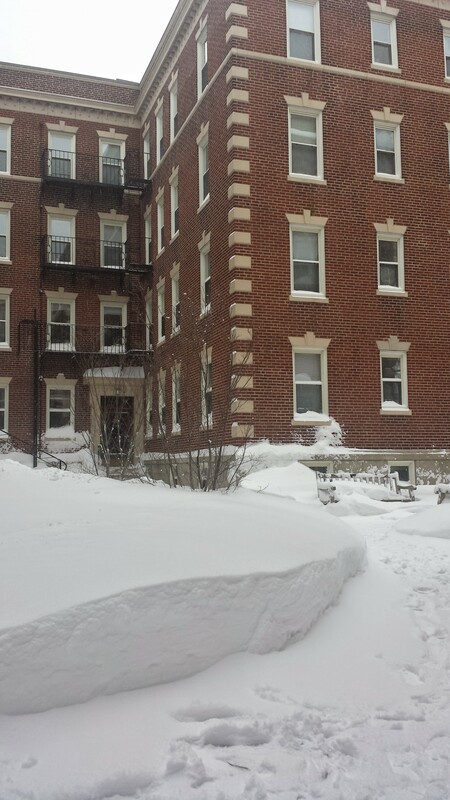 Sunday, February 1st – Sunday through Monday, we got another foot of snow mixed with some ice, closing almost everything on Monday..except Harvard; Cade had to go to class. 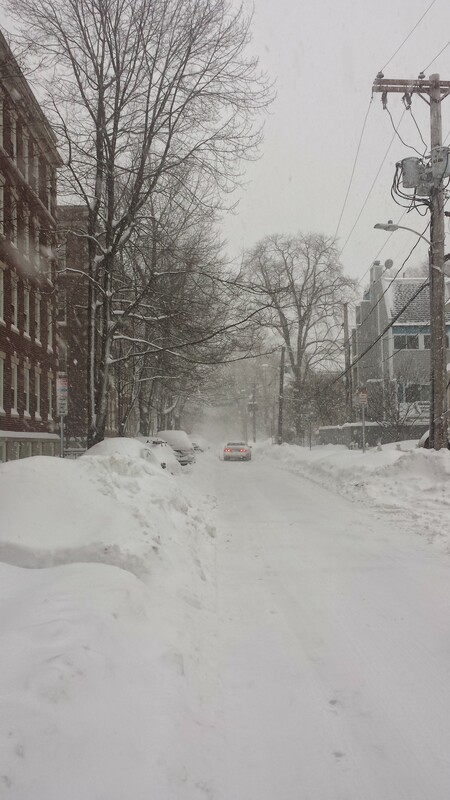 With the amount of snow, Boston Public Schools closed on Tuesday, as well, which would have given me a fourth snow day, but I chose to pick up an extra day at work to make up for lost time (and money). Sunday, February 8th – This snow storm lasting from Sunday to very early morning on Tuesday, gave us another couple feet of snow and me my fourth and five snow days. Again pretty much everything had to close down, including the MBTA trains, mainly because the trains are old and they can’t get the tracks cleared enough to get them running. In fact, the Red line from JFK/UMass to Braintree won’t be open again until (maybe) Monday, leaving many people very irritated and having to take shuttle buses. 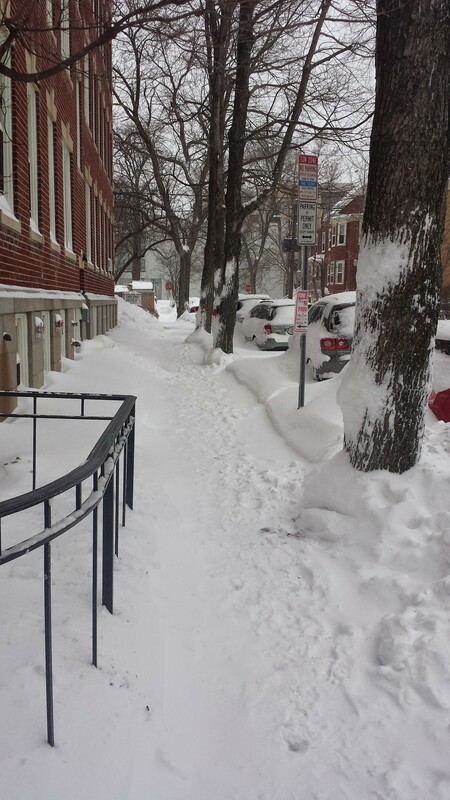 Boston entered another state of emergency and has now used up all of its snow removal budget for the season. 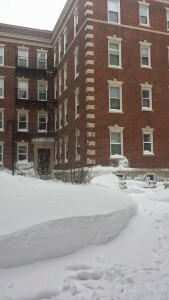 Although everything closed down on Monday and Tuesday, Boston College decided to open Tuesday at 10:30am. As you can imagine, this angered pretty much the entire student body. Lucky for me and the other social work students, we don’t have any classes on Tuesdays, so we weren’t affected by this; however, I can definitely understand the frustration. With all the continuing snow, I have not been to the middle school for my internship since January 26th. (The kids have been since then; it just continues to work out that snow keeps me from going on my days.) It seems as though I will be returning to the school tomorrow, though, breaking this crazy cycle of falling behind in my hours. As of right now, the snow total has reached 78 inches, and that’s in less than a months’s time! Sunday, February 15th – Keeping with tradition at this point, we got yet another snow storm over the past weekend. 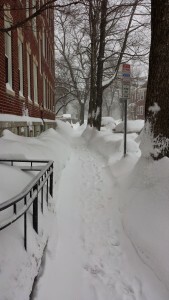 We got over another foot of snow, which led to the MBTA closing down on Sunday to attempt to keep up with snow removal. Actually, many parts of the MBTA train lines aren’t scheduled to be reopened for a couple more weeks. They’re really struggling to get everything cleared enough for the trains to have enough traction to run. 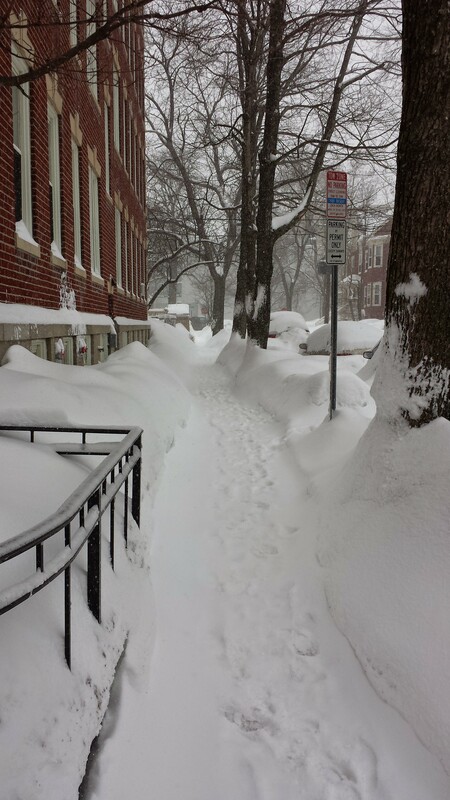 Luckily, most things were closed that Monday with the President’s Day holiday, and Boston Public Schools were closed for the week for February recess. We continued to have little bits of snow here and there throughout the week, mainly on Wednesday and Thursday. With all of that, we have now bumped up to the second snowiest winter on record at over 96 inches! At this point, I’m seriously hoping for us to break the record for snowiest winter (only 11 more inches to go! ), because how funny would that be for Cade and I’s first winter in New England. One of the big down sides to all of the snow (besides the difficulty in getting around) is that many people are having issues with roof collapses. There have been many businesses, especially those with flat roofs, that have collapsed under all that weight. Luckily, it seems that someone has taken care of ours, but it’s hard to be sure with the building being 4 stories high. Doesn’t this look so nice and sun-shiny? Wish that was the case that day…it was freezing, and there’s way more snow here than this picture lets on..obviously, if you’ve read the above. Thought it was a really pretty view from the train I was on but such lies. 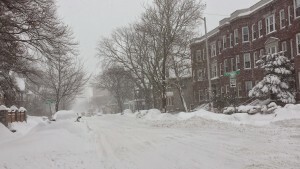 Saturday, February 21st – Over the weekend we got yet a little more snow. This one was nothing compared to what we’ve been getting, but the temperature also got above freezing for like the first time in over a month, and with it it brought rain. At first thought, this seemed good – warm temperature, rain melts snow..except when the temperature drops into the negatives the following night and everything freezes. Granted, there wasn’t nearly as much ice as I had expected, but I’ve had to pay extra attention to what I’m stepping on this week due to the random black ice patches. This small snow storm pushed us over 99 inches! 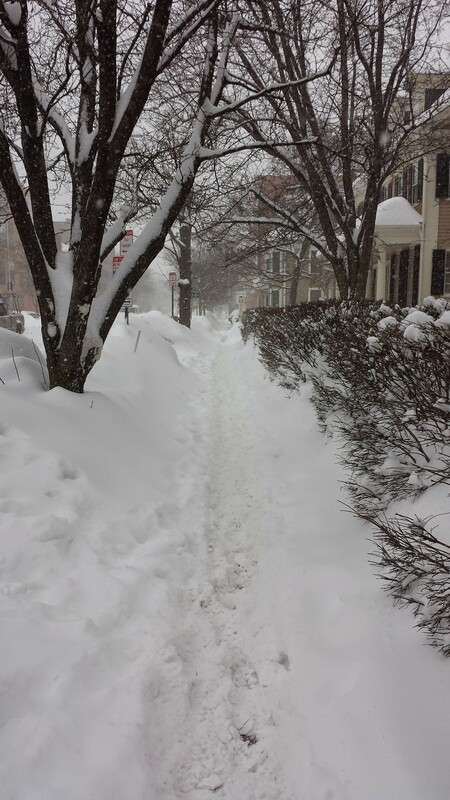 Remember the record for snowiest winter is 107.6 inches. 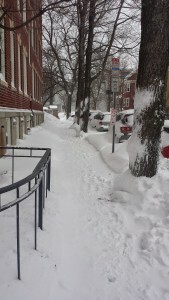 Tuesday, February 24th – So, this entry is minuscule with only a light dusting; however, it bumped us over 100 inches! I’m still holding out hope for us beating the record, but if that doesn’t happen we can say that our first winter in New England gave us 100 inches of snow..now that my friends is cray cray! Saturday, February 28th – From Saturday to Sunday we got another small snow storm. It was such a nice surprise bringing in March…cue disgruntled face. While this wasn’t quite the way I wan’t to enter into March, leaving the snow in February, it did get us closer to that 107.6 inch record. After this mini storm, we are not totaling in at 104.1 inches. With the upcoming small storms, I bet you we’re going to break that record. Fingers crossed! 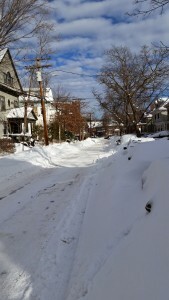 Sunday, March 15th – So, it finally happened..we broke the previous record for snowiest winter! Hot dog, we did it! With a snow shower, giving us another 2.9 inches, making our total snowfall 108.6 inches. That’s over 9 feet! 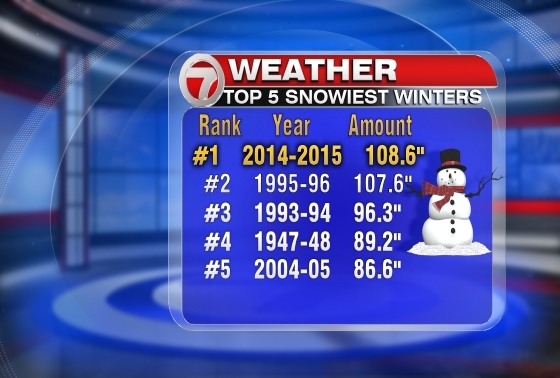 Cade and I know will forever have the story of our first winter in New England broke the record for snowiest winter. I’m sure to make it even better we’ll have to add that we had to walk 5 miles to class in 9 feet of snow (even though most has melted) with freezing temperatures. Gotta make our future generations believe that we had to struggle. 🙂 Now, that we reached the record, I’m ready to move on and welcome spring! 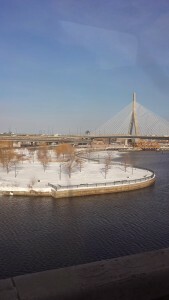 Friday, March 20th – Well, the welcoming in spring thing didn’t happen. 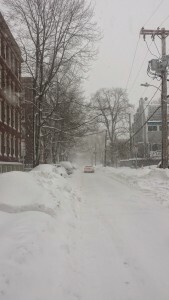 On (what was supposed to be) the first day of spring, the snow gods decided to give us another 1.7 inches of snow. I think that the weather is just being defiant with us now..”ready for spring?..haha, I’ll dump more snow on you for being hopeful.” I guess the only good news is that we’re widening the gap between us and any other seasons that attempt to reach the snow record. Let’s just hope that 110.3 inches is good enough for several seasons to come…at least for the next couple that we’ll be around. 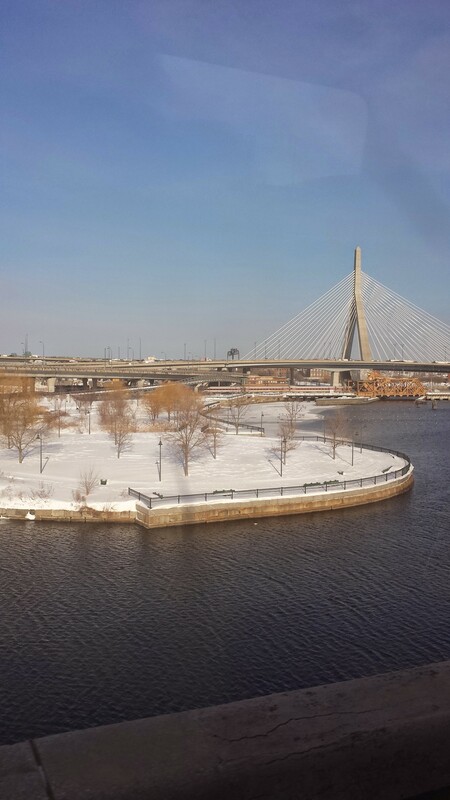 I told Cade earlier that this puts paid to Andy’s (I think that was his name) statements that Boston winters are no different than Midwest winters. At least it wasn’t bad until after the holidays!